We deliver to all countries in the EEC plus Switzerland and Monaco for orders made via the website. For all other countries please contact our Export department. Products will be delivered no later than 30 days following receipt of the order in mainland France, and will be dispatched to the address provided by the buyer. VOUSSERT SAS cannot be held responsible for delivery problems attributable to the buyer, or when such problems arise either as a result of unforeseeable and insurmountable circumstances caused by a third party, or as a result of an instance of force majeure. Courier delivery does not include carrying products up stairs. Please inform us of any access problems to your premises so that our team can make arrangements accordingly. Pallets are shrink-wrapped before leaving our warehouse. Below this level, delivery charges are calculated automatically by the website based on your location and the weight of the products to be shipped. Free delivery does not apply to Corsica, due to the heavy costs involved. * We are obliged to make an exception for items which are too big or heavy for standard transportation. Certain very heavy or large items require special transport arrangements, and cannot be treated as standard deliveries. Charges for 'special deliveries' will be clearly indicated in the associated product information. Companies with an intracommunity VAT number are exonerated form VAT. This number must be provided when you register with us. The number will be verified before your order is signed off by our team. For customers in Switzerland, the cost of delivery to your address automatically includes French customs duties (goods leaving the EEC). Warning: You will still be responsible for paying Swiss VAT and any customs duties due in Switzerland. For the Principality of Monaco delivery costs will automatically be calculated in your Basket If in doubt, please don't hesitate to get in touch. 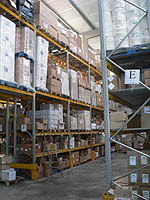 Products are delivered either by the postal service or an independent courier firm, depending on the nature of the goods ordered and at the sole discretion of Voussert SAS. Deliveries will be made to the address shown on the client's order form. We can arrange specific times and conditions for your delivery as long as these requirements are clearly specified when you place the order. If you provide the email address of the department(s) receiving the deliveries (even across multiple sites), you will receive real-time email updates when your products leave our warehouse, along with full information on the delivery conditions.